Thousands of overjoyed Scientologists gather on Sunday, September 9, in the center of Germany’s industrial heartland to celebrate the opening of a new landmark, the Church of Scientology Stuttgart. 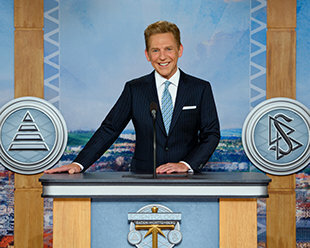 Mr. David Miscavige, Chairman of the Board Religious Technology Center, presides over the glorious celebration of the new Church of Scientology Stuttgart. In this land of ingenuity and innovation, Mr. Miscavige gives the keynote address in recognition of an historic day for all German Scientologists. Thousands gather in support of religious freedom as the Church of Scientology Stuttgart sheds her ribbon and opens her doors. The spirit of the moment fills the air as Scientologists from Stuttgart and the surrounding regions gather to dedicate their new home. Cheers ring out as a new era dawns for German Scientologists with the grand opening of the latest jewel in the city’s cultural crown. An exhilarating rendition of “Ein Hoch auf uns” (“Here’s to Us”) sets the tone for an event celebrating the grand new home for Scientologists in Baden-Württemberg. Mr. David Miscavige with (left to right): Alexander Petz, Human Rights Attorney; Dr. Elke Preusser-Franke, President of the Jewish Women’s Association of Germany; Mr. Samir El Midani, Advisor to the Stuttgart Interfaith Center; and Ms. Jirina Hlasivcova, youth drug education counselor, Center for Drug Prevention and Therapy. With the fall of the ribbon, the crowd makes their way into the magnificent new Church of Scientology. The stunning new Church of Scientology makes a grand impression as attendees get their first look inside. Taking it all in—parishioners tour their new home in central Stuttgart from top to bottom. A standout facility, the 78,000-square-foot Church of Scientology is just a 10-minute walk away from the city’s main train station, a commuter hub that draws nearly a quarter-million passengers a day. RECEPTION Open seven days a week, morning to night, the Church of Scientology of Stuttgart Reception welcomes anyone wishing to receive an introduction to Dianetics and Scientology. SCIENTOLOGY PUBLIC INFORMATION CENTER The Public Information Center offers more than 500 films, providing a complete introduction to every aspect of Dianetics and Scientology. It includes the beliefs and practices of the religion, a biographical presentation on the life and legacy of Founder, L. Ron Hubbard, as well as the many humanitarian initiatives and community outreach programs the Church supports. INTRODUCTORY SERVICES The Church of Scientology Stuttgart provides for the delivery of all Introductory Services. Among the many services available are evening and weekend Dianetics and Scientology seminars imparting an overview of the fundamental principles and their application for living. DIANETICS & SCIENTOLOGY BOOKSTORE The Church of Scientology Stuttgart Bookstore makes available L. Ron Hubbard’s works on Dianetics and Scientology. In all, Mr. Hubbard’s legacy comprises tens of millions of published words in dozens of books and thousands of recorded lectures. A Materials Guide Chart provides an informational overview of every book and lecture series and the subjects contained within each. Materials are available in 50 languages. THE PURIFICATION CENTER L. Ron Hubbard developed the Purification Program to free individuals from the mental and spiritual harm caused by residues from drugs and toxins in the body tissue, through a regimen of exercise, sauna and nutrition. The Center’s mural showcases the cultural icons that define Stuttgart’s industrial excellence and achievements. Each of the auditing rooms is ideally appointed to provide the calm, distraction-free setting requisite to achieving spiritual enlightenment. The Stuttgart Academy comprises multiple course rooms, each dedicated to a different aspect of training. DAS TAL CAFÉ The Valley Café welcomes visitors touring the Church and provides a gathering place for those attending any of the many scheduled events. It is further provided for parishioners during breaks in their Scientology services. THE CHAPEL The Chapel, lined with the Codes and Creed of the Church of Scientology, provides for all congregational ceremonies and services—including Sunday Services, Weddings and Naming Ceremonies. The Chapel also serves as an ideal venue for workshops, banquets and events, in the name of community collaboration for the betterment of Stuttgart. Lying between the Black Forest to the west and the Swabian Alps to the south, Stuttgart sits astride the Neckar River, running through the city’s valley known as “The Cauldron.” Rolling hills and scenic vineyards dotted with mammoth sequoia trees encircle this German powerhouse city, famous for hosting cultural and culinary festivals, in addition to producing world-renowned luxury cars. Sunday, September 9, marked a union of modern energy and classic history when more than 2,500 Scientologists and guests came together for the grand opening of a new Church of Scientology for Stuttgart. Mr. Miscavige presides over the state‑of‑the‑art celebration of the new Church of Scientology Stuttgart. With exactly that passion, the opening celebration kicked off with a traditional song and dance—a tribute to Stuttgart’s cultural heritage and its pride as a national leader in the performing arts. The music then switched to a rock and pop beat as a rousing chant filled the air, “Here’s to us—to now and forever.” That spirit of hope and expectation carried through to the remarks of local dignitaries who spoke of the impact this new center will have when helping Stuttgart face a host of problems. Indeed, while the city’s population is thriving, drugs, crime and other social pitfalls continue to be deep-seated concerns; and the Church has been at the frontline of social betterment and humanitarian campaigns to counter their advance. In just the last few years, the Stuttgart Church has supported the “Say No to Drugs—Say Yes to Life” initiative, educating people about the dangers of drugs by distributing The Truth About Drugs booklets, hosting drug prevention open houses, airing public service announcements and producing films that encourage children and teens to sign a drug-free pledge. In all, Drug-Free World Stuttgart has reached more than 250,000 with their Truth About Drugs message. The Church has also enlightened over 70,000 residents from Baden-Württemberg state on the perils of psychiatric drug abuse through the work of the Citizens Commission on Human Rights, a nonprofit watchdog group founded by the Church of Scientology. Alongside that is the Church-sponsored program United for Human Rights, which furthers rights for all people; and The Way to Happiness, a common sense guide to better living, also unrelentingly active across the region. So it is that each of these activities demonstrates the dedication and fervent commitment of Scientologists to help bring about greater awareness and humanitarian drive to Stuttgart and her citizens. As such, the city’s new Church of Scientology is exquisitely designed and was appointed to serve as a hub to connect with community partners as well as to provide services for the growing number of Scientologists. A standout facility, the impressive 78,000-square-foot Church is located on one of the city’s main thoroughfares, Heilbronner Strasse. Welcoming Scientologists to their new home was a diverse array of noteworthy civic and religious leaders. They included: Mr. Samir El Midani, Advisor to the Stuttgart Interfaith Center; Ms. Jirina Hlasivcova, youth drug education counselor, Center for Drug Prevention and Therapy; Dr. Elke Preusser-Franke, President of the Jewish Women’s Association of Germany; and Human Rights Attorney, Mr. Alexander Petz. As visitors enter Stuttgart’s new Church of Scientology they are struck by a palette of steel blue, chrome and greys that mirror the city’s high-tech identity. The facility’s pale highlights mixed with mahogany wood combine to give a calm, welcoming aspect to the Public Information Center where an introduction to Dianetics and Scientology is presented. Its displays, containing more than 500 films in 17 languages, share the beliefs and practices of the Scientology religion and the life and legacy of Founder, L. Ron Hubbard. The Information Center also presents the many humanitarian initiatives that Scientology supports, including their worldwide human rights education campaign; far-reaching drug education, prevention and rehabilitation program; global network of literacy and learning centers; and the Scientology Volunteer Minister corps, which has become one of the world’s largest independent relief forces. Stuttgart’s Chapel provides for Scientology congregational gatherings that include Sunday Services, Weddings and Naming Ceremonies, as well as a host of community-wide events such as banquets, seminars and workshops, open to members of all denominations. The Café offers a place to mingle for those attending events, as well as for parishioners during breaks in their Scientology services. The new Church allows for the delivery of all Introductory Services. These include afternoon, evening and weekend Dianetics and Scientology seminars, imparting an overview of fundamental principles and their application for living, as well as an array of Scientology Life Improvement Courses to help better any aspect of one’s life. The Stuttgart Church also features dozens of specially appointed rooms providing the ideal setting for Scientology auditing (spiritual counseling). Multiple course rooms are also dedicated to training auditors (spiritual counselors), for Scientologists studying the technology of auditing, and all to help others attain spiritual freedom. The new facility welcomes both Scientologists and those interested in learning more about the Church of Scientology. The opening of the new Church of Scientology Stuttgart continues an unrelenting growth period for the religion with nearly 70 new Churches of Scientology from Los Angeles to Tampa, London to Milan, Tel Aviv to Tokyo and Kaohsiung to Bogotá. In the past year, openings of new Churches of Scientology have taken place in Dublin, Ireland; Birmingham, England; Amsterdam, Netherlands; Johannesburg North, South Africa; Salt Lake City, Utah; Silicon Valley, California; Perth, Australia; and Orlando, Florida. More Church openings are planned for future months in global cities across Europe, Latin America, North America and Africa.